On our tours, we travel to lots of places that is hard to get by car and takes forever to walk to. Our Northern Exposure tour is no exception of that. We witness sights that not many visitors have witnessed, as well as seeing the most famous attractions in north Iceland. The first day after getting acquainted with the horses, farmers and fellow riders the ride leads us straight towards the mighty glacial river Jökulsá and to the mountains of the geothermal area Theistareykir. The next days are even more exciting. We take a hot steamy bath in the geothermal water Jarðböð, visit Dimmuborgir (where the 13 Icelandic Santa clauses live), visit Dettifoss the largest waterfall in Europe,Ábyrgi canyon one of the wonders of nature, a wide, horseshoe-shaped canyon with sheer cliff faces up to 100 m high and much more. 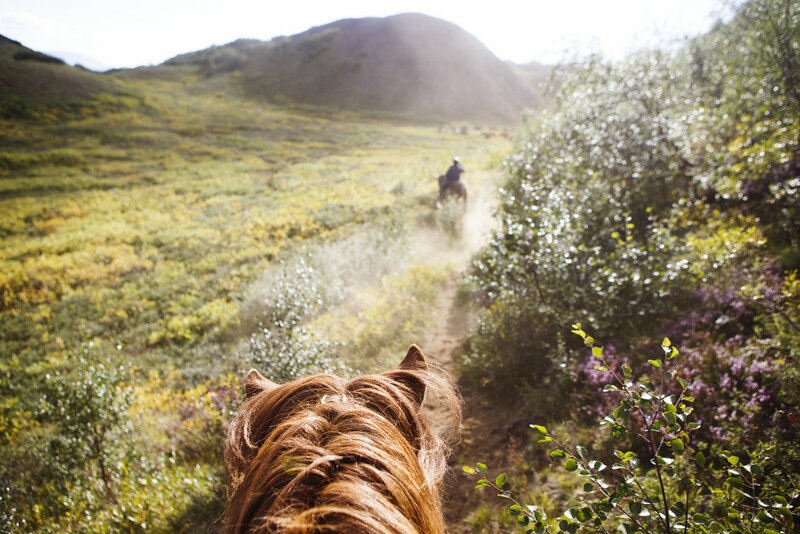 There is truly no better way to explore our beautiful Iceland than by riding the Icelandic horse and we are proud to announce that our Northern Exposure tour was nominated by the Sunday times as one of the 10 best trails in the world. Dettifoss is the most powerful waterfall in Europe falling 45 meters with a width of 100 meters. Jökulsárgljúfur is the canyon where the glacial river Jökulsá flows. The canyon is 25km long and 500 meters deep. There is no better way to explore Iceland than on a horse!